Lord Ganesh, is the ever blissful elephant headed god who is lovingly worshipped and revered world wide. 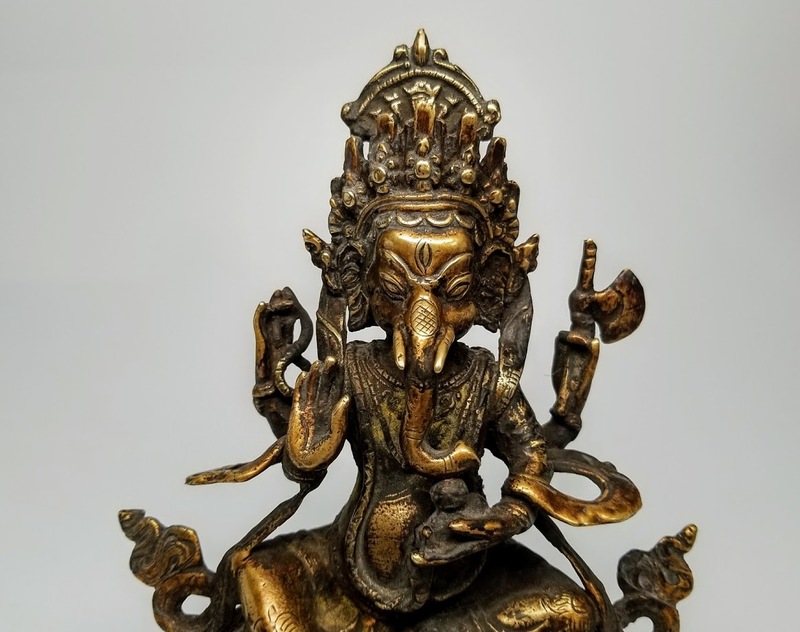 Ganesha emerged as a distinct deity in a clearly recognizable form in the 4th and 5th centuries. The son of Shiva and Parvati, Shree Ganesh is the god of wisdom, good luck, prophecy, success and auspiciousness. He's also known in Bhutan as LHA WANG-CHEN who is regarded as the defender and remover of obstacles. Devotion to Ganesha is widely diffused and extends to Jainism, Buddhism and Hinduism. It is believed that he has to be propitiated (i.e. win or gain the favor of a god, spirit, or person by doing something that pleases them) first before worship to other gods. His elephant head is an emblem of wisdom and his mount an emblem of sagacity. This figure is depicted seated. The position of his legs (one resting on the ground and one raised) indicates the importance of living and participating in the material world as well as in the spiritual world. 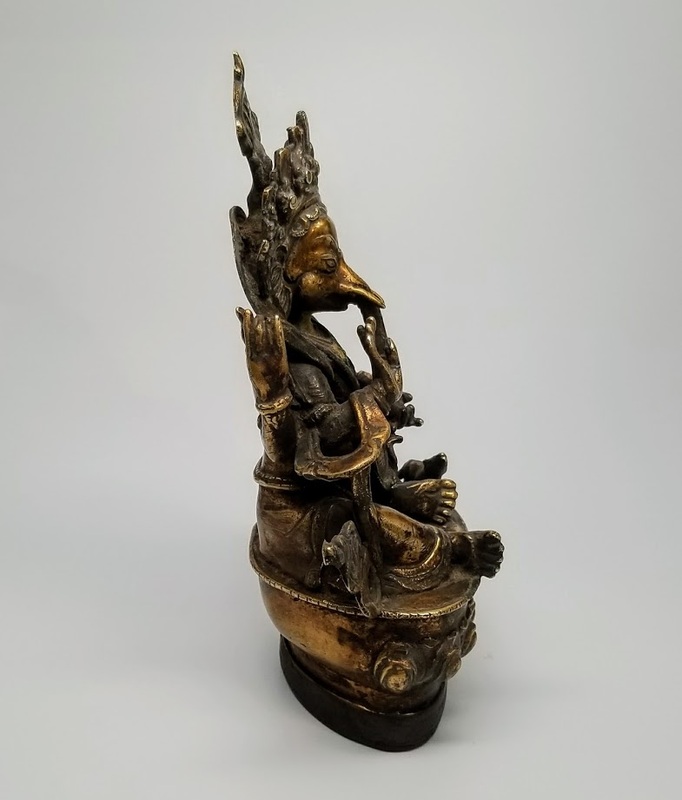 He sits on a lotus throne with his mount, the rat, which is known as Ganesha's devine vehicle. He's holding symbolic attributes in each hand of four arms representing the four inner attributes of the subtle body. That is: mind (Manas), intellect (Buddhi), ego (Ahamkara), and conditioned conscience (Chitta). The hand waving the axe is a symbol of the retrenchment of all desires and bearers of pain and suffering. A second hand holds a whip, a symbol of the force that ties the devout person to the eternal beatitude of god. The whip conveys that worldly attachments and desires should be rid of. 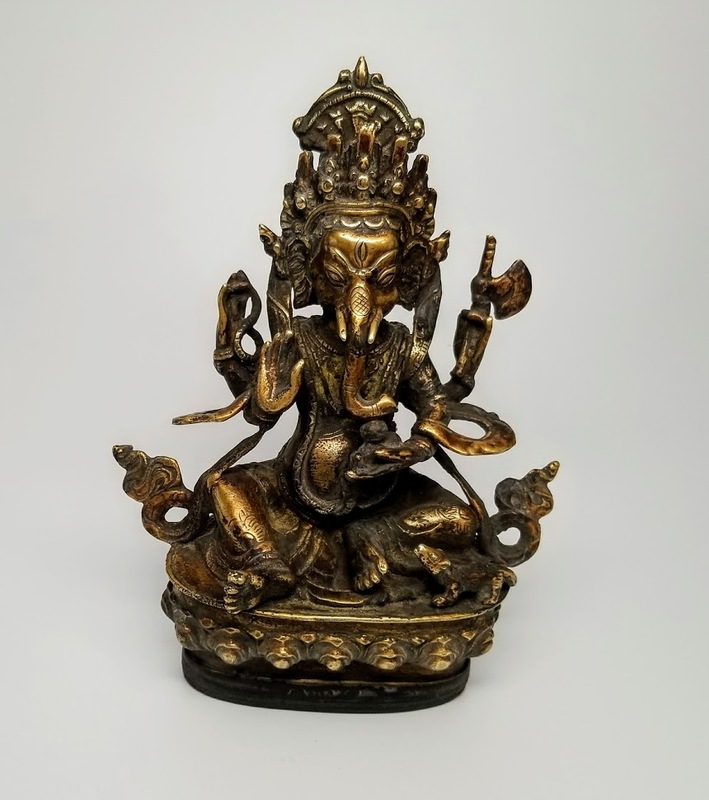 A third upraised hand, turned towards the devotee, depicts and is in a pose of blessing, refuge and protection meaning, 'Fear not, I am with you'. The fourth and lowered hand holds a lotus flower (padma), and it symbolizes the highest goal of human evolution, the sweetness of the realised inner self and endless giving as well as an invitation to bow down. This is also symbolic of the fact that we will all dissolve into earth one day. His large belly represents generosity and total acceptance. 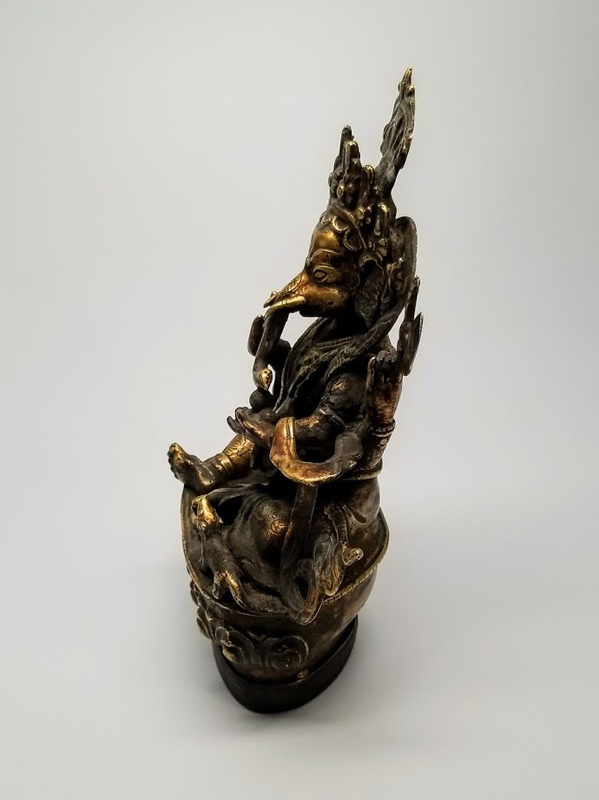 It is beautifully depicted in brass and copper, two of the five precious metals from which all Buddhist figures originating in Bhutan are made. This figure epitomizes the beauty and quality craftsmanship of handmade Bhutanese creations. The base is made from Cypress tree wood. The local seller assured us that the statue belonged to his grandfather thus making it at least two generations old (mid 20th century). It was kept and used in the family's home altar for the purpose of worship. 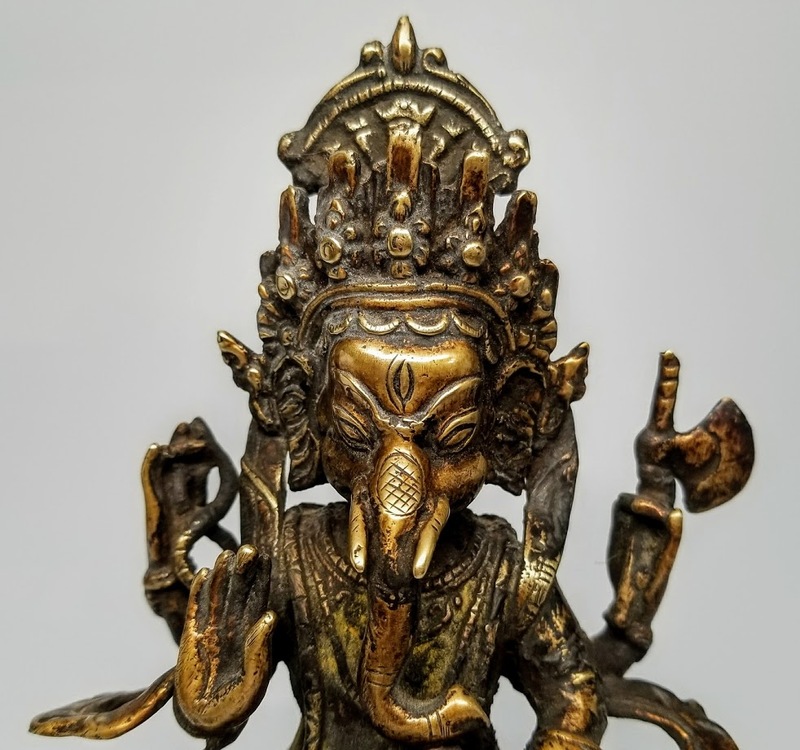 This finely detailed Ganesha measures 6" wide by 7.5" tall and 3.25" deep. A side note regarding rare Bhutanese hand-crafted artifacts; all are exclusively made by local artisans. The most common base of the material is that of copper, bronze, gold, silver, clay, wood and yak bone. 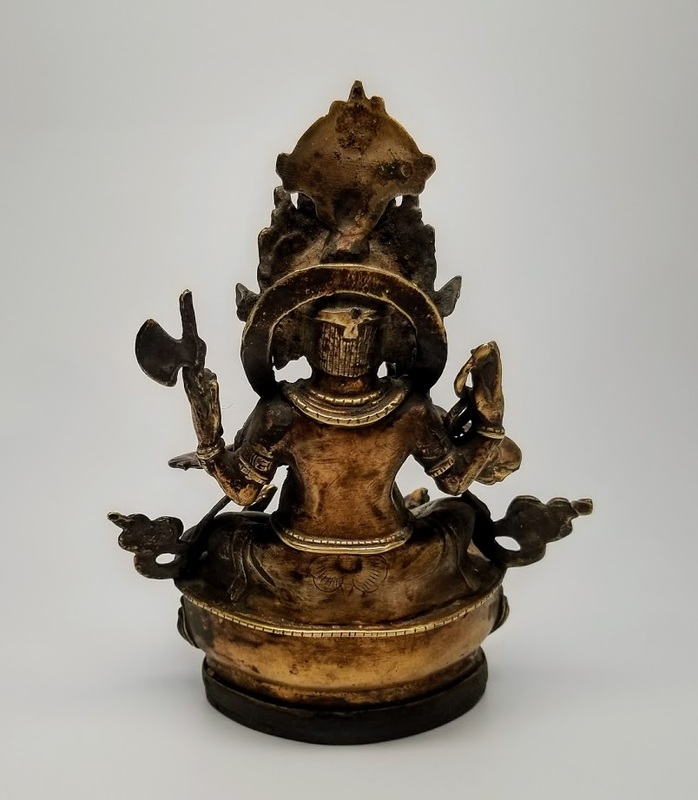 Old items in Bhutan that have no historical importance to the country or are not a property of any institution or monastic body can be used for the purpose of business. However it is important and required that each item be fully verified from the concerned agency to ensure the integrity of both the buyer and the seller. A mark or seal is provided by this agency upon successful inspection of the object. Most items are sold by families who were wealthy in past centuries and now desire funds to fulfill the modern day requirements such as education, housing and etc. 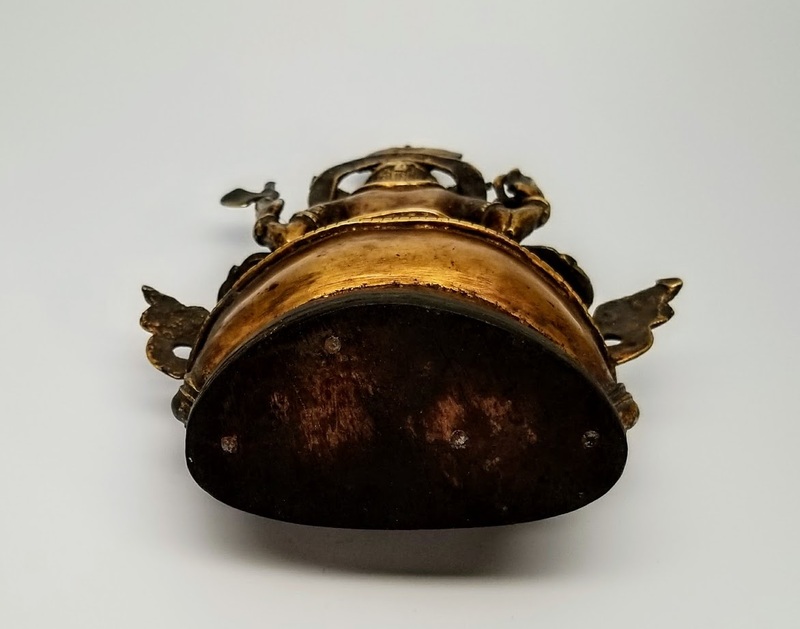 The mixture of metals used in the making of these artifacts enhances the preciousness and importance of the piece and is believed that the greater combination of metals, the more valuable its hidden spiritual power.